Danilo Mijatovic from KK Blokotehna-NB was chosen as the Most Valuable Player of season 2018/2019 in the Balkan League. The Serbian veteran stood above all in the competition averaging efficiency rating of 26.6. In 12 games he had 25.8 points and 6.1 rebounds and was a main reason behind his team′s success in the competition. Unfortunately Mijatovic couldn′t travel to Tirana and compete in SIGAL UNIQA Balkan League Final Four due to injury. 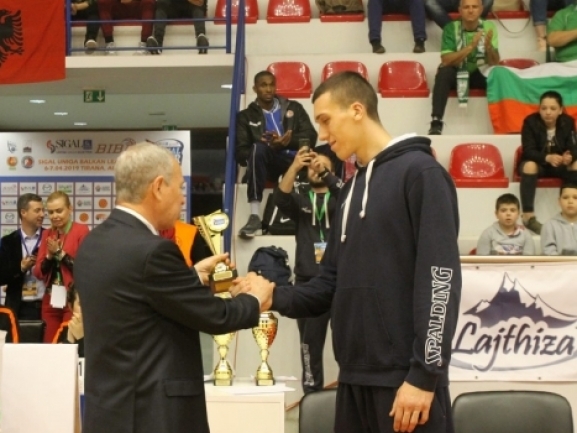 However after his team′s win in the semifinal against BC Academic Bultex 99, a special MVP trophy was presented to his teammate Aleksandar Kolev who received the award instead of him.